Many students have found successful ways to make money in college. Many times, unique and fresh ideas come from college students. They know what the younger, upcoming generation is interested in, and they profit off a business model that caters to it. Ever heard of Facebook, Google, Microsoft, Apple, or Dell? All multi-billion dollar companies, all started by students while attending college. OK, time to get real. I obviously don't have information leading you to discovering the next billion dollar business, but it's always good to think outside the box -- and college is the perfect time to do that. What I have done is compiled 5 simple ways to make money in college. I've also personally used all 5 of these methods and they have worked out great for me. I can't claim to have made a million dollars off them, but using all the techniques in conjunction has never left me with my pockets empty. It's perfectly fine to work at the local McDonald's or grocery store, you should be earning enough money there to cover the necessities of college life; but why make it hard on yourself? If you're looking for employment, find something that gives you valuable experience toward your chosen profession, or at least something that will give you some kind of life skill that doesn't include flipping burgers or waking up at 4:00 a.m. to stock shelves. I've come to really appreciate Federal work-study positions. It's usually a great way to get experience, network with college faculty and students, and an easy way to make money in college. Work-study positions may also allow you to do homework while getting paid, wouldn't that be nice? If you're interested in a work-study, contact your school's career services department. Check out your local Craigslist ads, grocery store or college bulletin boards for odd jobs. Odd jobs might include mowing lawns, driving the elderly, cleaning houses, etc. These odd jobs might sound kinda lame at first, but what you really want to be looking for is the opportunity for more work and possible business start ups. I actually discovered this side business by accident, and quickly learned it was a great way to make money in college. Traditionally, college students buy their books from the University or 3rd party book store. After the class ends, the student either sells the book back to the book store for a fraction of what they paid for it, or they throw it away because the book store isn't currently buying it back. Many students still do not know they can sell their textbooks online, and some students who do know don't want to go through the hassle of shipping the book and waiting for a paycheck. 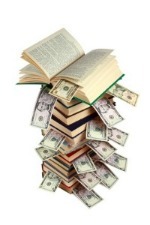 Online book stores however, usually pay much more than the University's book store. It's amazing how easily some students will give up their textbooks for a little money; especially if you buy all their books in bulk. For a little $200 investment or so, you can have a side business buying and selling textbooks. Buy the books locally, bargaining down as much as possible, and then immediately sell the books online and keep the profit. Know how much the book is selling for first, then make offers to students. Aim for a $20+ profit margin per book. The quickest way to make money in college on this list. Blogging and/or website creation is definitely the hardest way to make money in college on this list. Or at least, it's the most time consuming and doesn't pay out as quickly. However, with a bit of dedication and research, it can be very rewarding. Don't know the first thing about making a website? No biggie. There are a million places on the Internet right now that allow you to create a fully functional e-store, website, or blog without any HTML or CSS experience whatsoever. On a scale of 1-10, my experience in administrating and creating websites would probably be about a 2.5, yet my money making snowball (this website) continues to grow slowly -- but surely. more money than a full time job! Everyone is an expert on something. There is a profitable website behind any knowledge or product. Teach the world what you know, and then profit off the advertising, products, e-books, or web business deals. You don't have to be an expert to help a beginner through a subject. If you've completed a class and got a decent grade, chances are you have the knowledge to help another student through it as well. Most colleges are constantly looking for peer tutors. These tutors are paid much less than professional tutors, which is why the colleges love them so much. That being said, peer tutors are usually compensated well, compared to other unskilled jobs -- peer tutors at my school get paid $10.00 per hour, and when they are not tutoring they are free to do whatever they want on a school computer. By far the quickest way to make money in college, but many students neglect taking the time and energy thinking about the options. Professional accountants might give you piece of mind when filing your taxes, but here is a secret -- accountants are looking out for their own interests, not yours. Many accountants will do the least amount of work on a tax return as possible, and then charge you $60-$120 for their time. Do yourself a HUGE favor and look into what tax credits and deductions you qualify for. The first year I decided to do this myself, I made more than 200% more on my tax return than when I went to a "professional accountant".